At first glance the Puritan divines of early New England should seem to be as far from horror films, on the cultural divide, as phenomena can be. After all, academics long ago declared “genre fiction,” and particularly Gothic and horror fiction, to be lowbrow at best, and generally of no cultural worth. The amazing success of scary movies only underscores this point. Edward J. Ingebretsen (S.J. ), however, begs to differ. 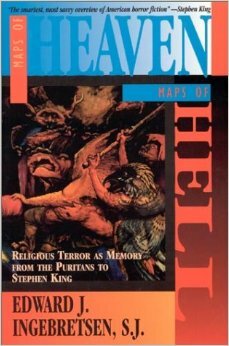 His wonderfully insightful book, Maps of Heaven, Maps of Hell: Religious Terror as Memory from the Puritans to Stephen King, is a surprising study of how religion and terror share much that is essentially human. On this blog I have, from time to time, claimed that religion and horror are close cousins. In fact, they may be siblings. Since studies of Cotton Mather and Jonathan Edwards are often produced by Reformed, or at least Protestant, theologians, it may be that a Catholic thinker will catch aspects often overlooked. The Puritans, with their Calvinistic underpinning, had a worldview that holds much in common with standard horror fare. Ingebretsen suggests that to map Heaven, you must also map Hell. The map conceit works well as the reader navigates through unconventional ways of thinking. The fears of the Puritans included the fear of God, and those who read or watch horror have noticed that nothing scares like the divine. It may not be on the surface, however. Even those not accustomed to deep digging can, upon a few moments’ reflection, see that the Gothic writers of the American canon have drawn repeated from this well. Many literary experts (well, some) celebrate H. P. Lovecraft’s atheistic rationalism, but enjoy his tales of the old gods nevertheless. His modern heir, Stephen King, is quite open about the potential fear of religion. He even blurbed the back cover of the book. As society grows continually more secular, the religious impulse will not disappear. Sublimation, the process of changing states, may hide what is happening from the casual eye. A close look shows, however, that the same fears Mather and Edwards unleashed on witch-addled, spider-fearing New Englanders, have come back to us in pulp and celluloid. Religion has its earliest roots in a kind of holy fear, it seems. The innovative human mind, however, with its drive to rationalize, devised mythologies that make fears seem plausible. Those mythologies are relatively easy to believe. Everybody likes a good story. Stories, with all their twists and turns, can leave you lost in the woods. It’s good to have a map. I would suggest Maps of Heaven, Maps of Hell. You may still be scared, but you may feel more sophisticated for it. It’s been some time since I’ve been to Salem. It’s been even longer since I’ve read Arthur Miller’s The Crucible. The events of 1692, however, continue to haunt me. 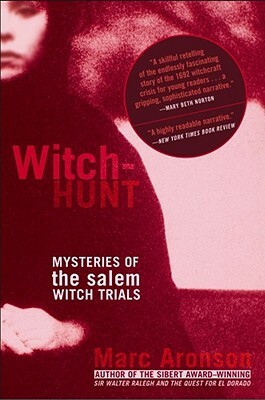 I recently read Marc Aronson’s Witch-Hunt: Mysteries of the Salem Witch Trials. Intended for a young adult readership, Aronson’s book really isn’t proposing any new theories about why religious violence was perpetrated against the vulnerable, mostly female, pool of those living in a very superstitious society. It does, however, show some of the issues in sharp relief—more academic books sometimes cloud the issues with erudition. Historians will continue to debate what happened in Massachusetts at the end of the seventeenth century when the Enlightenment was getting underway and the explanatory value of science was overcoming the world of miracle and magic. Even with science on our side, however, adequate explanations of the sad social madness of Salem are still lacking. As Aronson points out, there seems to have been a certain amount of greed involved as laws allowed the property of “witches” to be confiscated. Equally culpable are the learned clergy of the day, some of whom overrode their disinclination towards belief in witchcraft to hang a few women (and fewer men) for an imaginary crime. Lack of full historical documentation and the unrecorded lives of women often combine to raise many questions about Salem. It remains clear, however, that the outlook of the clergy influenced perceptions on the ground. Aronson suggests that Cotton Mather’s earlier accounts of Goodwife Glover of Boston—a woman executed as a witch without even her first name having been recorded—may have “inspired” similar violence among the population of Salem. When devils are suspected, the clergy are never far. When the mania died down after a lethal year, the clergy, both Increase and Cotton Mather among them, recanted the easy execution of a few expendable women, and fewer, less expendable men, in Salem. Since we lack documentation, we will never know fully what was behind the witch-hunts, apart from misogyny and misperception. Aronson ends his little book by asking us to consider modern terrorist hunts and the eerie similarities to the mindset of Salem. Listening to some media interviews, particularly on Fox, after the Boston Marathon bombings, we haven’t traveled so very far from Salem. In a world of high technology, where Satan is said to once again stroll the streets of Massachusetts, we have to wonder if the witch-hunts will ever truly end.